ANDM seem to be taking OPDO path. 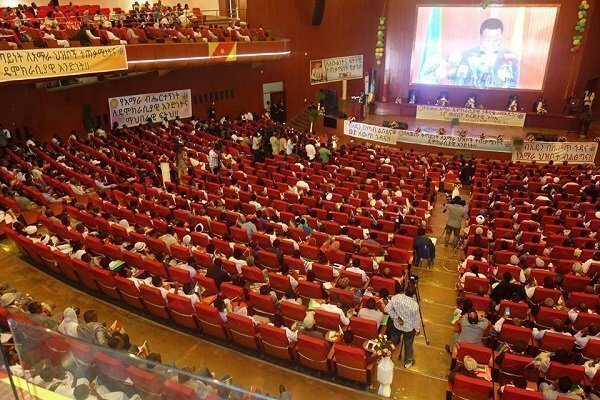 It renamed itself as Amhara Democratic Party (ADP). Amhara National Democratic Movement (ANDM), which is undertaking its 12th congress in Bahir Dar, reportedly changed its name to Amhara Democratic Party (ADP). The party is also changing its emblem, according to a report by Bahir Dar based Amhara Mass Media Agency. Proposal to change the emblem is approved by central committee of the party which is to be elected by the 12th congress. Accordingly, the new emblem is Green,Yellow and Red with the party’s logo. The party’s also to reform a selected sections of party regulation and guidelines. However, it remains unclear for now as to which sections of the party’s regulation are going to be amended. ADP is reportedly discussing controversial agenda including the border with Sudan and identity questions in the region. The party wants the Federal government to have a talk with Sudan regarding Delol region – a cultivable land that is given away to Sudan illegally. The party is also expected to purge executive and central committee members who are linked to squandering of resources from parastatal that are owned by the regional government. It is to be remembered that OPDO, one of the leading reform party within the ruling coalition, Ethiopian People’s Revolutionary Democratic Front (EPRDF), changed its name to Oromo Democratic Party in its 9th congress only a week or so ago.